I love the winter holiday time of year. 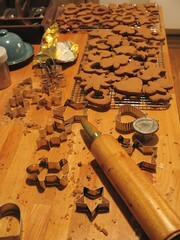 It's full of happy memories of traditions ... the same baking and decorating, and lots of time with loved ones. I now always try to make the same treats that my family always had when I was small since that's what feels "right". So it's Mom's shortbread cookies (some decorated using corn syrup as the glue for sprinkles), Grandfather's gingerbread men (some decorated with currants), and Dad's cheesies. Then there's homemade cinnamon bread and fruit bread. I might experiment with new things the other 11 months of the year, but in December, it's a necessary ritual to have the same things as always. I made some carved rubber stamps to make cards for my friends and family far away, but my outside-work has been so busy I did not do so soon enough to also offer cards in my shop. Next year perhaps. 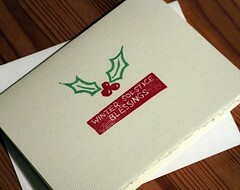 This year I did a holly motif on the cards. Some have the stamped greeting inside and just holly on the outside, some have 3-leaf holly, some just 2-leaf holly. Some have the greeting in green instead of red. Part of the fun is making every card just a little bit different. Next year I hope you do offer cards on Etsy. I have totally run out of my card stash and am really reluctant to buy from the commercial suppliers. Your holly ones are wonderful looking. 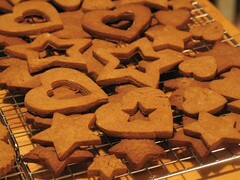 Maybe you could carve a little gingerbread man too?